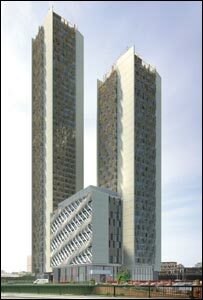 Plans to build Salford's two tallest tower blocks have been approved by the city's planning committee. Work is set to start on the 165m (541ft) and 111m (364ft) towers, opposite the MEN Arena, in January. The £180m development will boast 403 apartments, a rooftop swimming pool on the 31-storey building and observation deck on the 47-storey skyscraper. The plans include a low-rise five-star hotel with 203 beds, a new public square and urban park. Manchester-based developers BSC Group say restaurants, cafes and a sky bar will also be built at the site between Greengate, New Bridge Street and the River Irwell. Councillor Derek Antrobus, lead member for planning at Salford City Council, said: "The Greengate project plays a very important part in the regeneration of Salford and the plans will help to bring a forgotten part of the city back to life. "These developments also respect the heritage of the city and point to a vibrant future for Salford."